1997 : les pires films de l'année ! Maurice: Look what I found in international waters! The final scene of the theatrical version of the film where Annie is repeating her drivers test is shown at the very beginning. The name of the cruise ship was changed to "S.S. Legend". 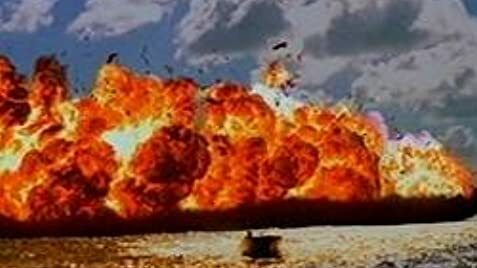 An additional scene was added showing crew of the Eindhoven Lion extinguishing the oil tanker after the bow thruster scene. An extended boat crash scene was added with more dialogue between the crew on the ship. An extended scene was added showing Alex walking through a crashed house and through St. Martin after jumping off the ship. for Big Yard Music Group Ltd. Courtesy of Virgin Records America, Inc. / Virgin Records Ltd.
Q: Will There be a Speed 3 movie sequel ? another great feature about this movie is the fact that people have to die 4 times before actually dying, or other impossible things that somehow the actors can make possible with their magic wand or something. a nice example: **** SPOILER **** The bad guy (i didn't even bother remembering his name) is flying one of those water planes. He isn't really paying attention as he flies over an oil tanker and hits the mast with a speed over 50 mph at minimum... Instead of crashing down or getting hit off course, nooo... the plane instantly stops and gets stuck at the top of the mast. The bad guy naturally hasn't a scratch. Then suddenly the plane decides to explode, taking the entire oil tanker with it. Of course there couldn't be any safety measures on board, since oil isn't flammable at all. 78 of 103 people found this review helpful. Was this review helpful to you?